Head strong and a little stubborn - but with their delightful mix of dignity and comedy, they will win your heart and are generally eager to please. They make great family pets, loving people especially children. Beware, they also have a tendency to jealousy if ignored by their owners! 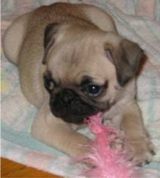 Training must be undertaken gently as puppies are really sensitive to voice tone! They love to romp and play outside, weather permitting! - ensure you have somewhere cool for them in hot weather - as they are prone to overheat. They are friendly, confident, playful, charming, lively and intelligent, and make lovely family pets - most owners agree, what this little dog lacks in stature, it makes up in personality! 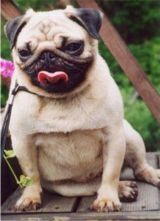 Pug dogs are thought to have arrived in Europe via the Dutch trading ships in the 16th Century - moving to Britain with the court of William of Orange, by the 18th Century it had become a prized fashion accessory! 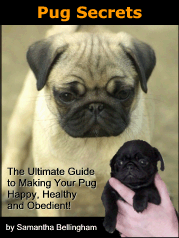 A very popular companion among young and old alike, the pug makes a good family pet. Only requires limited exercise, although happy to walk	if offered!